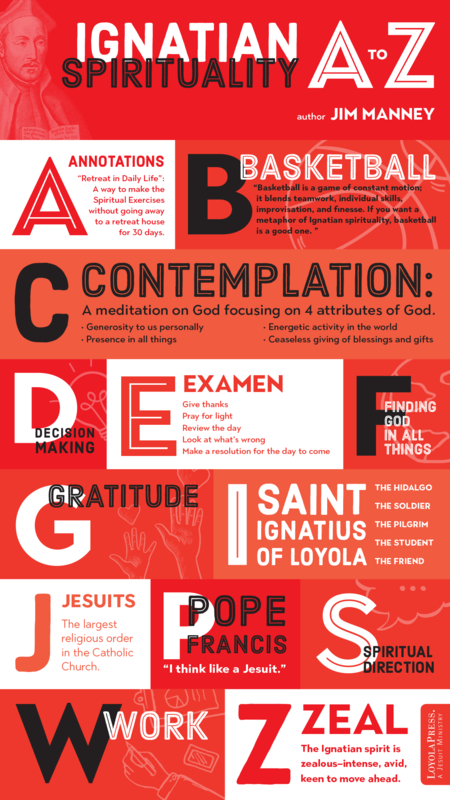 With Ignatian Spirituality A to Z, author Jim Manney has provided a brief, informative, and entertaining guide to key concepts of Ignatian spirituality and essential characters and events in Jesuit history. We’ve gathered a selection in the below infographic to whet your appetite. Explore other Ignatian terms throughout July with our ninth-annual 31 Days with St. Ignatius celebration. Start with our calendar of favorite Ignatian-themed links here. Then throughout July, dotMagis blog posts will feature a series of reflections on Ignatian themes, inspired by the list in Manney’s book. See what regular contributors and special guests like Jim Martin, SJ, Tim Muldoon, and Barbara Lee have to say about decision making, finding God in all things, pilgrimage, and more. Subscribe to dotMagis to receive posts in your inbox. Use the hashtag #31DayswithIgnatius on your favorite social media, and share the ways you’ve been touched by St. Ignatius and the spiritual outlook that bears his name. Use promo code 4975 to purchase your copy of Ignatian Spirituality A to Z for only $10. Shipping and handling are additional. Offer expires 8/3/18. Cannot be combined with other special offers. U.S. domestic shipping orders only. isn’t there simply a “book” or “books” telling about the Spiritual Excercises of St Ignatius. Elaine, yes, the Spiritual Exercises are in book format for those leading others through the 30-day retreat or participating in the retreat in daily life or another variation of the Exercises. I sense God as a Sculptor creating a masterpiece called Ignatius Loyola. Each strike of blade is a surprise. The final work of art cannot be rushed. All movements are part of the whole. Ignatius is to become a gift for the Church admired by all peoples in all times.